If you liked this show, you should follow Spiritual Spectra Talk Show. 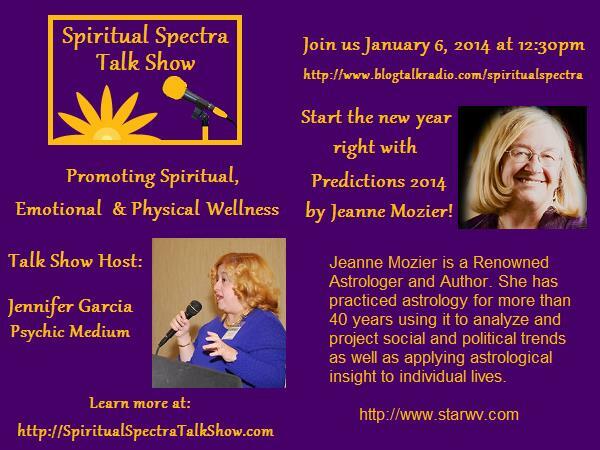 Listen to our exciting one-to-one interview with Jeanne Mozier as she shares her passion for Astrology with us. Then learn about the cosmic forces that influence global and personal life, love, money and fashion for 2014 as Jeanne shares her Astrological predictions on our show. Jeanne Mozier is a Renowned Astrologer and Author. She has practiced astrology for more than 40 years using it to analyze and project social & political trends as well as applying astrological insight to individual lives.